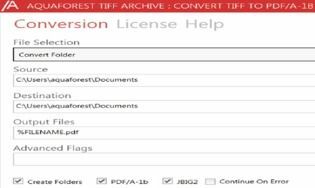 TIFF Archive is a tool that can convert large volumes of TIFF image files to PDF/A-1b compliant files.PDF/A-1b is a file format based on PDF which provides a mechanism for representing electronic documents in a manner that preserves their visual appearance over time, independent of the tools and systems used for creating, storing or rendering the files. See ISO 19005-1 for more information.The product may be used as command line tool for manual use or inclusion in scripts. See the reference guide for further information .